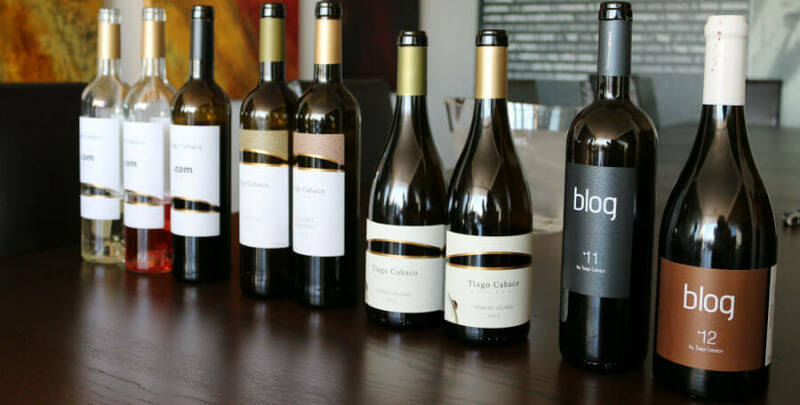 After last summer’s visit, I return once again to the wines of Tiago Cabaço. It’s also a return to Estremoz, where in addition to the built heritage one can also regain strengths in the producer’s mother’s restaurant, the cozy São Rosas. Three wines to be drunk at the table and unhurried. I am among those who believe that vigorous reds have to be saved for the colder months, when the weight of the meat requires anti-earthquake foundations. It is true that it nestles in a different way, but I do not spend the summer eating salads and poultry viands’. What I say about the reds, I would point it out to yellows too. Let’s go step by step so the words do not get spilled confusedly. From the whites to the red. The winemaker Susana Esteban continues to score. The .Com Premium White 2015 is a blend of the grape varieties Antão Vaz, Verdelho and Viognier. The fermentation took place in stainless steel tanks and no aging in oak barrels. 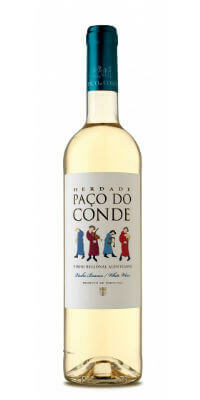 It’s a white for Alentejo nectars lovers, especially for lovers of the Antão Vaz fruit. It’s a wine with nerve and I would not drink it without food, but seafood isn’t recommended. Who knows, something more substantial. 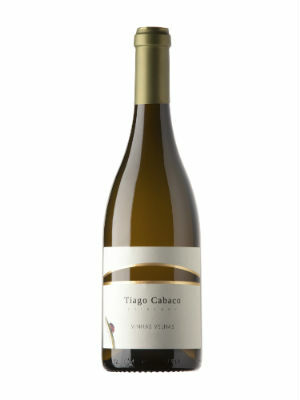 The Tiago Cabaço Vinhas Velhas White 2014 is a product of vines with more than 35 years. It’s a Blend of Roupeiro, Arinto and Antão Vaz. The technical sheet says that it was aged in wood, but does not provide any specifications. Anyway, the wood does not bring down the natural features. This one is more robust than the .Com Premium White 2015 and has the minerality that characterizes many Estremoz wines. It has an interesting balance between warmth and freshness. Finally, the “suspect”. I say suspect because before opening it I already kind of knew what would come out of the bottle. The Tiago Cabaço Alicante Bouschet 2012 has an unfortunate fate. It’s not demerit, but the previous year was very generous to the Portuguese winemakers. The grapes were trodden in stainless steel lagares. The wine aged a year in French oak barrels. The wood adds and does not take anything. I appreciate the combination of the ripe cherries, the earthy notes and the wood. It’s an Alentejo wine and a modern one. Right to the gut! To end with, I alert the reader that the nature of these favorable assessments to the red are because I personally like the wine. I’m not fond of the grape variety Antão Vaz, so even when enhancing the intrinsic quality of the wine, the words do not occur to me in a so cheerful way. On the other hand, I like a lot of the Alicante Bouschet grape variety. Moreover, this red grape variety is particularly happy on Tiago Cabaço’s property. This time I’m heading to Redondo town. Well, to the Roquevale town to be more exact, which is located on the road between Redondo and Serra D’Ossa. The company owns two estates totaling 185 ha, Herdade da Madeira Nova de Cima with its schist soils is focused on the production of red wines and Herdade do Monte Branco with its granitic soils is more oriented to the production of white wines. 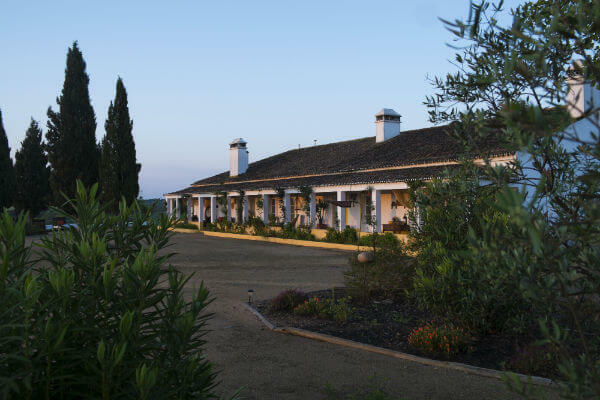 Nowadays, the company that is the second largest private company in Alentejo has a production of wine around 3 million liters per year and is leaded by the winemaker Joana Roque do Vale. Joana Roque do Vale always has always held hands with the world of wine, ever since her childhood in Torres Vedras where her great-grandfathers produced wine. After the April revolution her father, Carlos Roque do Vale, decided to move to Redondo town to take care of two estates which belonged to his father in law (who had already initiated the vineyard plantation there in 1970). Roquevale was born in 1983 from a partnership between Carlos Roque do Vale and his father in law. Joana’s path was sealed, the world of wine was her second home and at a glance she had already made her internship at Herdade do Esporão. She learned with the best, her internship coordinators were the engineer Francisco Colaço do Rosário and the winemaker Luís Duarte (who ate the time was also Roquevale’s consultant). After finishing the course she started working in the family’s company where she would shortly get in charge of the company’s oenology. The wine highlighted in this vertical tasting was considered for many years the company’s top-end brand and its name is Tinto da Talha Grande Escolha that shows us the two best grape varieties of each harvest. The tasting began with the 2003 vintage up until the 2010, showing in all the vintages a wine that faced the passing of time with naturalness and showed no signs of old age. This wine has always underwent a pass through new barrels. In the earlier vintages stands out the regular presence of Touriga Nacional that was always being interspersed with Aragonês or Syrah, which would then give its place to Alicante Bouschet matching with Syrah or Aragonês. The 2009 was the only year in which Touriga Nacional was joined with Alicante Bouschet. The one I liked the most was the 2010 (Aragonês/Touriga Nacional). It showed a duo in perfect harmony in a set full of life with plenty of ripe fruit and some vegetal. It’s ample, gluttonous, exuberant with a bit of rusticity, in a good and faithful tone to the region and asking for food around. The 2008 Aragonês/Alicante Bouschet is also very good, showing a full and gluttonous set with cacao, juicy fruit slightly sweet, all balanced and fresh, and balm in the background. The palate is tasty and balanced with tannins slightly marking the finish. The 2003 follows the same tone and puts together Touriga Nacional and Aragonês, which being the first vintage showed up in good shape putting together a beautiful set freshness (with thin balm) with ripe red fruit, leather, spices, in a “still with energy” average body and a long finish. The Tinto (red) da Talha Grande Escolha 2009 brings together Touriga Nacional with Alicante Bouschet. Starts off with a fresh vegetal and ripe fruit with a sweet note, somewhat chemical at first, all very new and full of steam and tasty, good freshness but a shorter finish than I expected. The Aragonês/Syrah 2007 is among all the one that speaks the less, closed with a chemical aroma at first, cacao, pepper, fruit wrapped in jam, freshness wrapping everything and tasty mouth, in the background shows strawberry candy with balsamic in a set well-structured, well-supported and persistent. A wine that has still plenty to give and it’s currently undergoing changes. The 2004 vintage Syrah/Touriga Nacional is a red with vigorous fruit, plenty of pepper with milk chocolate, round and closely-knit and a slight vegetal in the background. Shows clean and tasty fruit, acid cherry, blackberry, easy to like. The 2005 Touriga Nacional/Aragonês showed a wine more open and spaced, shy but showing Roquevale’s nature quite clearly. Much better in the mouth and if the nose was as excellent this would be a tremendous wine. For last I left the 2006 Syrah/Touriga Nacional which I liked the least. In the glass there were to many chemical aromas with strong vegetal, a rough set, very smoky and some rusticity. Slightly fresh in the mouth with some fruit, medium body and not following the tone of its brothers in arms. 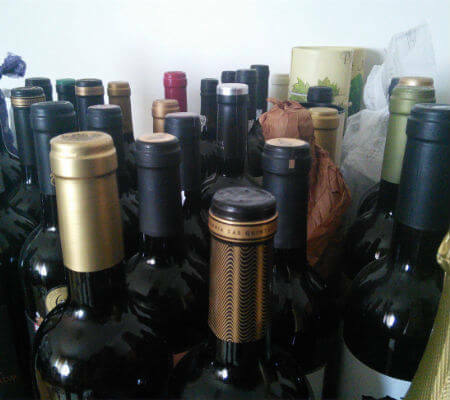 In my early oenophile days, I acquired the habit of long-term wine saving in my cellar. The idea is and will always be to feed my curiosity for watching some of them evolve, as well as the absolute need for keeping another few wines that end up forgotten in there for many years. Those who like wines and who like to enjoy them are usually naturally curious; being curious is part of the condition of being human. That same curiosity makes us want to know a little more about how wines will behave through time, and even how time can educate them or not. What can be taken for certain is that risk is always a factor worth remembering, especially when the wines we keep have no kind of history to back them, ensuring that our patience will prove successful. The exception is all the wines that need to rest for a spell because they are too young and have edgy tannins. And then, a few dozens, then hundreds of bottles end up piled up by type or region. I promise you, the hardest part is beginning all this process. So far, surprises have almost always turned out well; there is always something to learn from these comparisons of the wine when it was young against the adult version it became. Some appear tired and reveal somewhat pronounced wrinkles of old age. 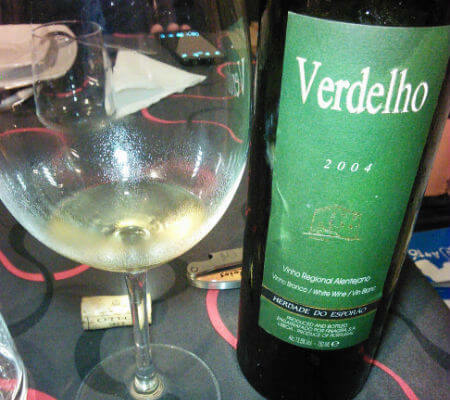 Very recently, on the occasion of a dinner with friends at my place, I decided to salvage one of those wines I have been keeping in the cellar, a Esporão Verdelho 2004. 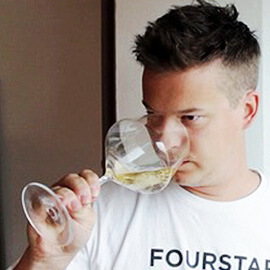 This 11 year-old white is a risk, or a moment of insanity – some might say. As it turns out, however, this Verdelho was very able to achieve the wow factor usually only observed in great wines. That factor emerges when most of the people present let a faint smile slip after they taste the wine in their glass and mutter the word “Wow.” I tasted this wine time and again when it was first released into the market. I liked it so much, that I decided to save a few bottles. This may have been the last surviving Verdelho 2004, that revealed envious freshness on the mouth and nose, all the fruit that used to be fresh and is now embraced in syrup, and slightly sweetened, with vegetal touches of herbal tea and a bouquet of flowers, everything is very well composed, forming a serious and adult wine with very well-set values. On the mouth, freshness and a hint of creaminess rolls the fruit round the palate; the latter appears solid and with very good presence, and providing a lot of pleasure when you drink it at first, and again, and again, tirelessly. This is one of the reasons why I store wine; especially curiosity, but also the satisfaction of having the opportunity to later share them with people who can appreciate their value. The only downside is when a bottle is dried out and we ask ourselves why we didn’t store a few extra bottles. 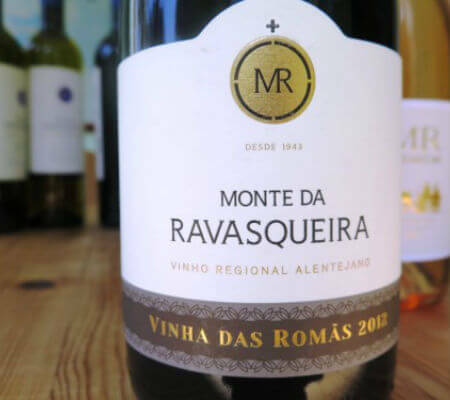 I was bowled over by Monte da Ravasqueira’s latest releases, especially Monte da Ravasqueira Premium White 2012, Premium Rosé 2013 and Vinha das Romãs 2012. A case of third time lucky because, although invariably well made, this Alentejo’s producer’s wines were not an instant hit with me. Did I miss something? Even the best wine tasters sometimes get out of bed on the wrong side! A vertical tasting this June went some way to answering my question. Looking at different vintages of the same wine is my favourite way to assess, not only the impact of the ‘hand of god’ (vintage variation), but also the human hand – changes in viticultural and winemaking approach are laid bare too. So what did I learn from looking at three vintages of Monte da Ravasqueira Vinha das Romãs (2012, 2011, 2010)? If we’re talking ‘hand of god,’ each vintage lived up to expectation. The 2012 was elegant with good structure. The denser 2011 had more powerful fruit. As for the 2010, it was relatively open-knit and, with a splash of Alicante Bouschet, a touch rustic – significantly the least age-worthy of the trio (even taking into account its relative age). All in all, it seemed to me that the 2012 had an extra degree of refinement – greater finesse. With brighter, better-defined fruit, it was more balanced than the teetering towards over-ripe 2011. In fact, contrary to received wisdom about these vintages, I reckon the 2012 will comfortably outlive the 2011. How come? The varietal mix (70% Syrah, 30% Touriga Franca) is the same, as is the winemaking; I don’t think a year’s difference in vine age matters a jot (as a general rule, wines attain better balance with age). For me the answer lies in Monte da Ravasqueira’s adoption of precision viticulture in 2012 (and the dynamic incoming Chief Winemaker who implemented it, Pedro Pereira Gonçalves). To borrow from The Oxford Companion to Wine (Jancis Robinson MW), precision viticulture means “vineyard management is targeted rather than implemented uniformly over large areas.” It involves using technologies like infrared imaging, global positioning systems (GPS) and geographic information systems (GIS) first to assess, then manage, vineyard variables (such as soil type, depth and structure) which influence wine quality, quantity and style. For Gonçalves, managing the variables within each of Monte da Ravasqueira’s 29 vineyard blocks, even within the same variety, has been the key to a “true interpretation of terroir.” Returning to the sheer balance of the 2012, one senses that each vine performed to the best of its ability, making it easier to pick at lower baumé before grape sugars shot up and while natural acidity was good. At any rate it surely explains why the 2012 vintage is a full degree and a half lower in alcohol by volume. Here are my notes on the wines from Vinha das Romãs. Incidentally, Romãs refers to the vineyard’s previous incarnation – it was a pomegranate orchard until 2002 when a five hectare parcel was replanted to Syrah and Touriga Franca. The plot is vinified and bottled separately because it produces particularly ripe, concentrated grapes. Among the many differences between men and women, the aesthetic of bodies is one of the funniest, given their being directly opposite. Ladies spend their lives terrified of not being fit; they may be thin, but mirrors tell them they look fatter than they actually are. Men, on the other hand, might even be bloated, but they always see Tarzan (played by John Weissmuller) in the mirror. Another difference, but still within the same parameter, is age: ladies tend to notice years going by; they adopt different strategies in order to feel comfortable with their age. If it weren’t for the “sudden”, “unusual”, “inexplicable” and “unique” stitch, Gentlemen would think they are ten years old forever, and always fit for a football match – Cristiano Ronaldo obviously only kicks the ball around, comparing to regular old male Homo Sapiens sapiens. I am no exception. When I met Tiago Cabaço, I thought he was young. So far, so good. The problem is it brought to memory an amazing meal at his mother’s restaurant, São Rosas, in Estremoz. Now, that memory has a flaw: I was there either on the first or the second day of its opening… in 1994! — Oh my God! I’m old! Tiago Cabaço is 33 years old, so when I was there, he must have been kicking a football around, probably dreaming about turning into the next Luís Figo – to me, the best Portuguese football player ever, with due respect for His Excellency Eusébio da Silva Ferriera, a.k.a. Pantera Negra (black panther). He told me his closest friends lived 2 miles away, so he spent most of his childhood with people who worked at the house, so they usually played football with him after a long day’s work. Of course, Tiago Cabaço is now a good 4 inches taller than me… Well, let’s get to the wine. He started working when he was six years old, baling straw; he made 2000 escudos a day (10 euros, now actually 27.5 euros, after calculating the coefficient ratio of currency devaluation, a calculation supplied by the Portuguese Ministry for Finance). When he was 14, he became a motorcycle racing driver and won a few championships, having given the activity up in 2003. He started working in the wine business in 2000, distributing his family’s production, Monte dos Cabaços, made in Herdade de Trocaleite. He thought there was a lack of references in their supply, so he decided to start growing wine. He made his first creation in 2006 using the 2004 vintage. 50,000 bottles were made at first; today they have 500,000, and they might possibly reach 600,000 this year – the cellar’s maximum capacity. 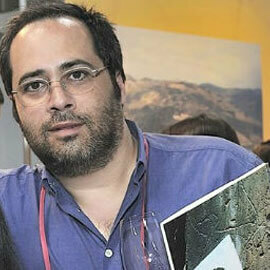 “The wines are made in the field” – says Tiago Cabaço, who only wants a few simple interventions in the cellar. The sky is always the limit: grapes to make the Blog wines. 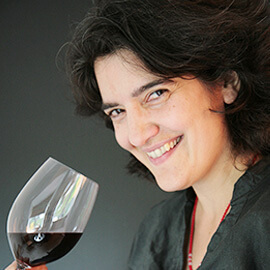 Later, Susana Estebán, the oenologist, will decide what to use for what. “Acid has never been used to correct a wine” – she promises. She explains that she grew up in a property where they had no electricity, no gas, and no running water, but a vineyard was already there. The first seven acres of Alicante Bouschet, in 2006, grew into 203 acres of Alvarinho, Antão Vaz, Arinto, Encruzado, Gouveio, Marsanne, Roupeiro, Sauvignon Blanc, Verdelho (from Madeira), Verdejo (from Rueda) and Viosinho, the white varieties; the red varieties were Alicante Bouschet, Aragonês, Cabernet Sauvignon, Petit Syrah, Petit Verdot, Syrah Touriga Nacional, and Trincadeira. They make 17 references, including a white brand for Pingo Doce supermarket chain. There will soon be a new product other than wine… he asked that I keep it secret! I will tell you later. The property’s grounds are rich in open-clay and schist (30%). The white grapes are mostly planted in schist-rich ground. They water about 60% of the plantation, but no more than twice a year. In “painter season” – when grapes change from green to yellow or purple – some water is supplied; this is also the moment when a few bunches are weeded out, because “if you do it sooner, the grape will grow more”, explains the producer. They might lightly water it again, when the colour change is complete. The most symbolic brands are related to the internet: blog, .Com and .Beb (“.Drink”). Let’s get to it, then. The white .Com 2014 was made from Antão Vaz, Verdelho (Madeira) and Viognier varieties. It’s a relaxed wine. Seeing as I’m not a very big fan of the Antão Vaz variety – and I rarely get any pleasure out of nectars it’s a part of – I don’t have much of an interest in it. But that’s my own problem. The truth is most consumers enjoy it; otherwise it wouldn’t be planted all over Alentejo. 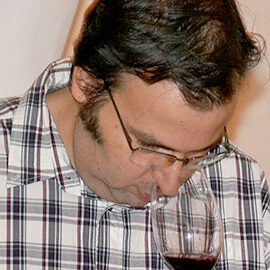 Tiago Cabaço Encruzado 2013 was the first in the signature. The producer said he was very hesitant to name a wine after himself, but the pressure created by his fame made him cave. This wine, made from this white Dão variety, is a tribute to his father, who first planted it in Alentejo – as assured by the wine grower. 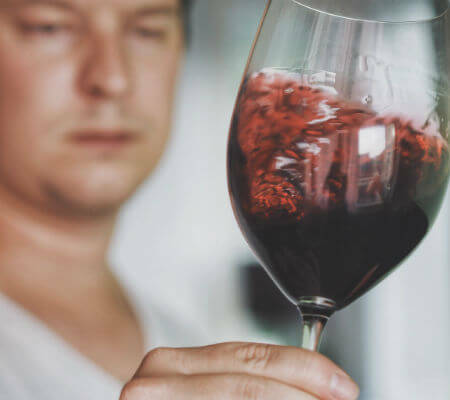 It’s a peculiar wine, different from others made in its region of origin, but it maintains the refreshing character and transmits the minerality of the ground. 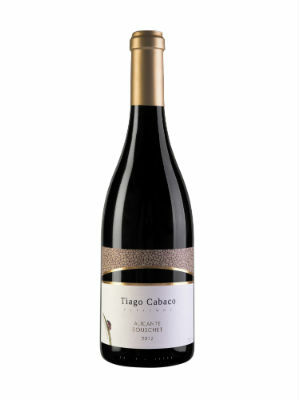 Tiago Cabaço Vinhas Velhas 2013 is a lot composed of Antão Vaz, Arinto and Roupeiro. It’s very refreshing, and ageing it in wood doesn’t harm nature, especially the tangerine. It’s quite a pleasant dance from sweet to bitter, ending in a soft dryness. The .Com Premium Rosé 2014 is born from Touriga Nacional grapes, and it’s a good bet for those who enjoy rosé wines. 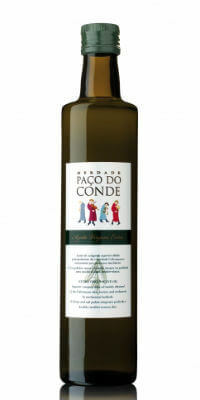 It appears fruity and floral on the nose: lychees (a floral-scented fruit), lemon (peel), not very ripe blackberries, and violets – a typical scent in this Dão-grown variety, not always apparent in other regions. It’s mineral and dry in the mouth, and suggests delicate food, but it could come along just for a chat with friends. The .Com Premium 2013 has the scent of the Alentejo-grown variation of the variety; closer to blackberry jam or red currant syrup. It’s soft, easy – very easy – to please. 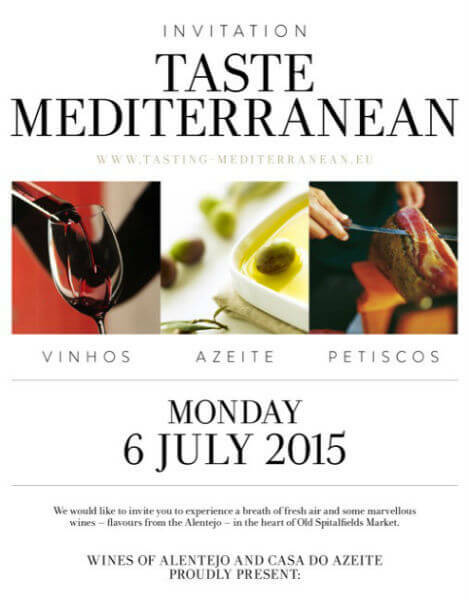 It results from the combination of grapes from Alicante Bouschet, Aragonês, Touriga Nacional and Trincadeira. I don’t recommend it for hot weather. Tiago Cabaço Vinhas Velhas Red 2013 is very Alentejo. How can I define an Alentejo wine? By saying it’s from Alentejo! Beautiful! Blog Alicante Bouschet + Syrah 2011 is soft and slippery, given its freshness. It isn’t delicate, it’s noble. It could be served at a marriage proposal in a fine restaurant. And it promises a long life, also what you wish for love. Now, Blog Alicante Bouschet + Syrah 2012 is the most complex; it needs more time before it can see the light of day (or night). It’s harsh, and strong… I would give this one to my doctor, after a 12-hour-long surgery… I haven’t been operated on. Out of all the wines I tasted, Tiago Cabaço Alicante Bouschet 2011 was the one that latched onto me and didn’t let go. It’s complicated to define it in aromatic terms; it has fruit, chocolate, ore, vegetables and spices… not one of each… I could be here writing descriptions until tomorrow. The mouth is equally complex… I am an artsy person, and my imagination sometimes takes me to… I would take it to a secret meeting in a dark room, to summon ghosts. Some place made of stone, with heavy furniture made from excellent old wood from overseas colonies, heavy Renaissance tapestries, and 17th Century Flemish paintings. It isn’t heavy; it’s “symbolic and ritualistic.” It will live until I am walking around with a cane. It’s polished, dry… A great find! Companhia das Quintas, although not a big business in Portugal, has a broad range of properties spread across different regions. From top to bottom: Quinta da Fronteira (Douro), Quinta do Cardo (Beira Interior), Quinta de Pancas (Lisbon) and Herdade da Farizoa (Alentejo). The one in Alentejo is possibly the least known. Quinta de Pancas has been a reference in the Portuguese scenario for a long time; Quinta do Cardo is an exception in recognised wines from its region; Quinta de Fronteira is in well-advertised Douro, and Herdade da Farizoa, although in the most successful Portuguese region in terms of sales, faces a higher number of big competitors. Herdade da Farizoa was bought in 2000, and the cellar was built in the following year. It has a slightly different characteristic: they don’t make white wine. The vine plantation includes Alicante Bouschet (10 acres), Alfrocheiro (9 acres), Aragonês (37 acres), Cabernet Sauvignon (16 acres), Syrah (13.5 acres), Touriga Franca (about 2 acres), Touriga Nacional (16 acres) and Trincadeira (25 acres). They also had five acres of Tinta Caiada, which were later pulled out. They have been turned into fallow land, to later be seeded with Alicante Bouschet. 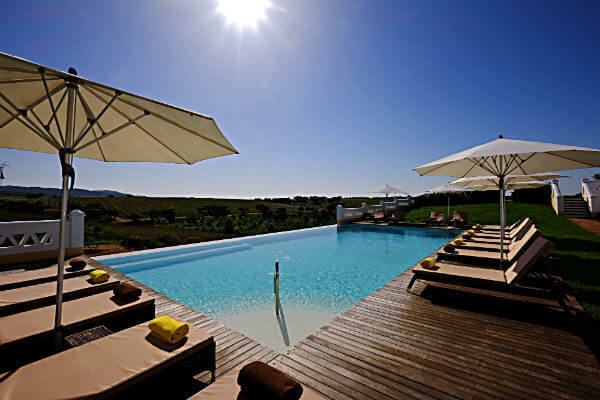 The vine takes up a small part of the property – small in Alentejo terms, with 385 acres. The space is rented out, and is mostly covered with forests of cork oak and holly oak, as well as pastureland. There is also a ten-acre olive grove. The ground is a mix of clay, marble and schist. It’s in Elvas county, and inside the Borba boundaries. The company has been restructured, having started out with only administrative and commercial services. 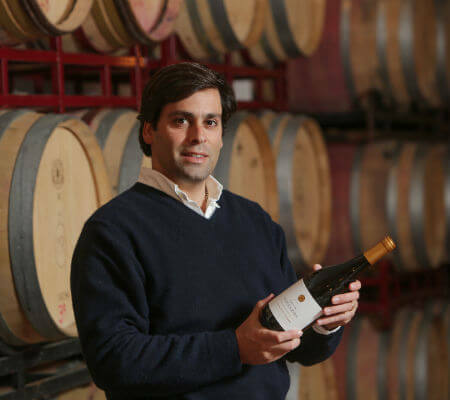 After oenologists Nuno do Ó, who embraced his own business, and João Corrêa, who fell ill, left, Frederico Vilar Gomes was hired to direct field and oenology operations. He is young, and already confirmed as one of the country’s top experts. New blood, that brought innovation, some of it carrying some risk. There is freedom for experiments. Frederico Vilar Gomes grants resident oenologists in every property responsibility and freedom, because they know the land, the environment and the grapes better than no one. I visited another property and tasted a sample… opinions were divided, but the expert from the quinta is a believer, so let the trial begin. In Herdade da Farizoa, Joaquim Mendes is the boss. 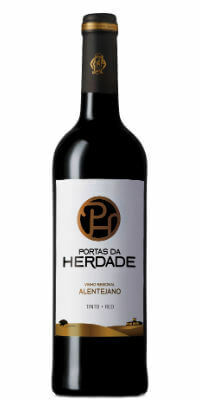 They make Portas da Herdade, Herdade da Farizoa, Herdade da Farizoa Reserva and Herdade da Farizoa Grande Reserva (previously known as Grande Escolha). Portas da Herdade 2014 is a safe bet for days spent outdoors, and accompanying meat on the grill. It’s soft and slippery. It’s a lot of Alicante Bouschet (5%), Aragonês (40%), Syrah (15%) and Trincadeira (15%). 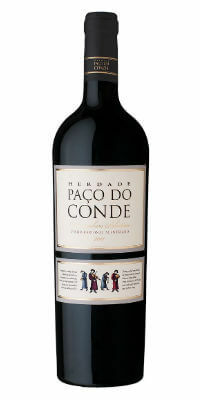 Herdade da Farizoa also stands by youth and fruit, being richer than the prior. Aragonês (50%), Syrah (30%), and Touriga Nacional (20%) appear well matched. It works well with grilled food, but pasta is another good choice. 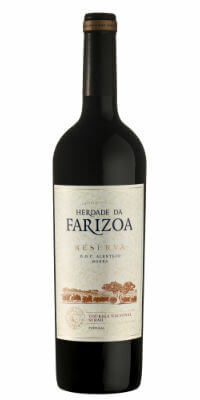 Herdade da Farizoa Reserva 2010 is an Alentejo wine made with Touriga Nacional (67%) and Syrah (33%). It’s another sign of the Portuguese variety’s plasticity, and the ease of adaptation of the French variety. I usually put it on the table in autumn, along with stronger foods, usually eaten in winter. 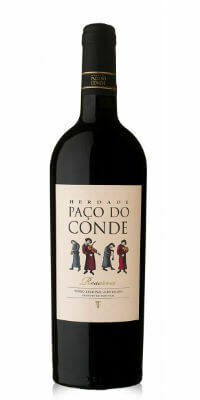 Herdade da Farizoa Grande Escolha 2009 was a surprise to me. Seeing as Alentejo is a hot region, and although this property lends its freshness, the wine’s liveliness blew all my expectations. It didn’t show oxidisation, it revealed aromas of mint, wheat stubble, white pepper and dry roses. It started off sweet and ended dry. Herdade da Farizoa Grande Reserva 2012 reveals a few of its older brother’s features, such as the mint and the wheat stubble. For people of Alentejo blood, like me, the scent of holm oak wood is very comforting. Pinches of nutmeg and aniseed escape from it. On the mouth, it reveals blackberries and blueberries, dry earth and cocoa. It has structure and fibre, but no harshness. It doesn’t appear as sweet as the prior, and ends dry. This lot has Syrah (75%) and Touriga Nacional (25%). My memory is not what it used to be, but I can still remember visiting Herdade do Sobroso a few years ago, when everything was still setting off. The essential was already there: the vineyard, the forest and the kindness. Now returning with more time, I am better equipped to observe the property development that has settled there since, both in terms of wine growth and wine tourism. It binds Alentejo, in its hot hues, to the city – thanks to the contemporary mode, and without the usual coldness. This tasteful architecture is linked to Architect Ginestal Machado’s stroke, him being a reference in the renowned Escola do Porto, and having given Portugal two Pritzker Architecture Prizes – the Nobel Prize in architecture. When Ginestal Machado bought these 3950 acres in 2000, there was nothing there, due to the previous owners’ lack of dedication. A lot has been done and there is no stopping nature. This territory is also a hunting ground. Not surprisingly, I observed a broad variety and large number of animals when Filipe Teixeira Pinto, an employee and resident oenologist, brought me on a tour on 4×4. I felt as if I were in a report for National Geographic Magazine: deer, mouflon, rabbits, hares, partridge, quail, black boar, wild ducks… The story says Sus scrofa (oink oink) are usually big and heavy, and one day, one of those black boar almost double the average size ever seen in Herdade do Sobroso was hunted. Wine isn’t everything, but it is the subject of this chronicle, and I have already rambled a little. Alentejo is a big region, the biggest in Portugal – about a third of continental Portugal, covering over 37,735 square yards – but many different realities take place inside. Herdade do Sobroso, Vidigueira, is an area with Designation of Controlled Origin, and famous for its white wines. Thanks to its orography and the margin of the Guadiana river, this area can achieve freshness often not present in Alentejo essences. Filipe Teixeira Pinto can count on Luís Duarte’s consulting support. Out of the 3954 acres, only 128 are growing vines. The vinestock is composed of local, national and international varieties. All the white varieties are Portuguese: Alvarinho, Antão Vaz, Arinto, Perrum and Verdelho. The reds are more “travelled”: Alicante Bouschet, Alfrocheiro, Aragonês (Tempranillo), Cabernet Sauvignon, Syrah and Tinta Grossa. The first wine went on sale in 2008, and was made from the 2006 harvest. The main theme of the wines is freshness, which conveys wines their elegance. I think they are very wisely bringing down the alcohol levels, an almost inevitable feature in hotter regions. The rosé has 12.5% alcohol and the whites 13%, which is quite rare nowadays. Judging by the alcohol levels, it’s easy to see that the rosé is not a by-product of the reds. Its grapes are harvested before the white ones. Sobro Rosé 2014 can combine two wishes, because it works (dangerously) well with relaxed chats, and makes an excellent accompaniment for delicate food. It was entirely made from Alicante Bouschet grapes. The many wild ducks living there inspired the low-end brand, Anas – the family this webfooted bird belongs to is Anatidae. Anas Branco 2014 is a dialogue between Antão Vaz, a warm Alentejo variety, and Arinto, a national and very refreshing variety. They work well together (many producers have been resorting to this match), especially since the autochthonous variety has been pulled to a stop for being too heavy because it was harvested “too early” (at the right time). It’s delicious, and requires a chair and a pleasant view. 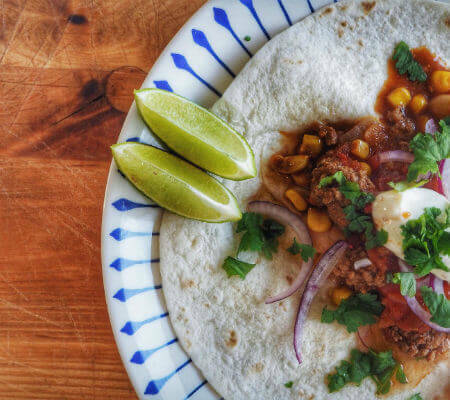 Sobro white 2014 is more appropriate for food. Once again, the technical team kept the Antão Vaz grapes from crushing the wine. Perrum and Arinto were added in. Sobro red 2014 was made with Aragonês (Tempranillo) , Alicante Bouschet, Cabernet Sauvignon and Syrah grapes. My note goes to the beautiful Cabernet Sauvignon, which makes it more virtuous. Unfortunately, in Portugal, not everyone knows how to work with this variety – or they aren’t supposed to due to inadaptability. Sweet pepper is not the case here. Inside Herdade do Sobroso red 2013, I found Alentejo. The others have it too, but this one “was born there and lives there”. The lot has a singing accent, because of the Aragonês (Tempranillo) , Alicante Bouschet and Alfrocheiro grapes. Watch out for the red fruits and the chocolate, they pull your focus away like goblins… 14% alcohol. It’s time to eat, and the only thing I can think of is “carne de alguidar”, a traditional Alentejo specialty consisting in seasoned ribeye steak with sweet pepper pasta and a lot of garlic, with a side of migas (seasoned and moist bread made into a firm crumble). Herdade do Sobroso Cellar Selection 2013 (red) is quite unique; it represents the owners’ taste, a signature wine. The match between Alicante Bouschet and Syrah is astounding and, once again, its freshness makes it dangerous. This is 14.5% alcohol. It’s a great wine. In terms of personal taste, this is my choice. At last, the tippy top. Herdade do Sobroso Reserva 2012 (red) is also a wine of excellence, with elegance, requiring food and a long chat in an endless evening. The lot is made of Aragonês (Tempranillo), Alicante Bouschet and Cabernet Sauvignon grapes. In this case, the most notable is the French variety, adding “a bite”, spices and greens seasoning the baking chocolate, ripe cherries and vanilla. Once again, a short leash: 14.5% alcohol. When I showed them this photo, I’m not sure if my sommelier group was relieved or disappointed not to meet the owner of the Portuguese wine industry’s best curated moustache, Paulo Laureano. As one drily observed, “he looks shy.” In fact a little unhinged in this picture, though this is far from the truth – I can assure you Paulo Laureano is as poised as his wines or indeed the waxed tips of his moustache! He could not personally show us his wines since the winemaker was in Brazil looking after his markets. But, when it comes to those made under his own label (he consults widely), his focus is squarely on home. 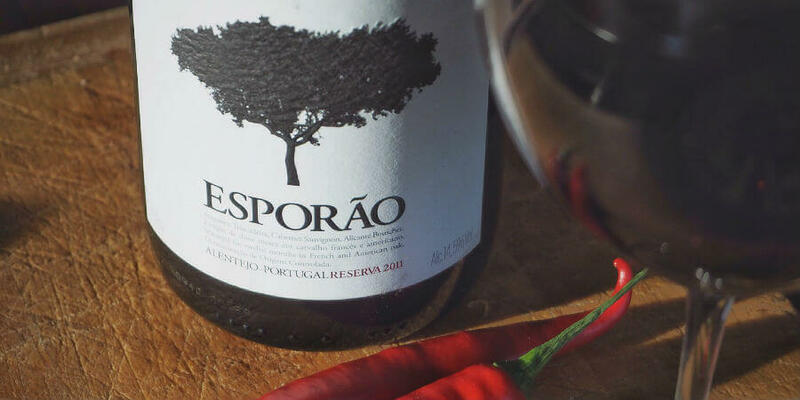 Not just on native Portuguese grape varieties (including world’s only single varietal Tinta Grossa red), but also the region in which he was born, Alentejo. Owing to this warm, dry, southerly region’s popularity with supermarket buyers, Alentejo is best known in the UK for soft, approachable, fruity (jammy even) reds. It is most definitely not known for its whites. So it came as something as a surprise for my group to discover that Alentejo’s southern-most DOC sub-region, Vidigueira, can produce such restrained reds and whites – the perfect foil for the fine dining experience their restaurants offer at London’s The Ritz, Gordon Ramsey’s Maze, Butler’s Wharf Chop House and Yauatcha, as well as Nuno Mende’s new Portuguese-focused small plates dining experience, Taberna do Mercado where I shall be presenting Alentejo wines to the trade next month. How has Laureano conquered white winemaking so far south? When I first met Laureano several years ago he explained that, despite its location, Vidigueira’s special micro-climate accounts for this restraint and structure. Moisture levels are higher and the climate more temperate than you might think because, owing to its topography, Atlantic breezes still manage to wend their way some 60km inland. What’s more, Vidigueira benefits from higher rainfall because of the Serra do Mendro, from which cold air descends at night, cooling the vineyards. The cherry on the cake is the schist soils which characterise so many top Alentejo wines. Why? First, because these lean, rocky soils offer little in the way of nutrients to the vines, which keeps yields low. Second, because schist has the capacity to store and slowly “meter” water to vines (just like in the Douro). Now you know why Vidigueira has a history of white winemaking. Here are my notes on Laureano’s wines which, I might add, I found fresher and more precise (especially the whites) than in the past. Partly down to earlier picking I am told. This deeply coloured blend of Aragonês, Trincadeira and Alicante Bouschet reveals juicy blackberry and blackcurrant fruit with savoury, leafy tobacco and raddichio notes. Dusty, schistous minerality lends freshness and nuance to the finish. Tannins (fine) and acidity (fresh) are very well balanced. This Trincadeira-led (70%) blend (with Aragonês and Alicante Bouschet)is matured in French and American oak for 18 months, It has a mocha edge to its dark but juicy fresh picked berry, currant and sloe fruit with hints of clove. Like the other reds there’s not an iota of jamminess. Nice length and balance, wih fine tannins.